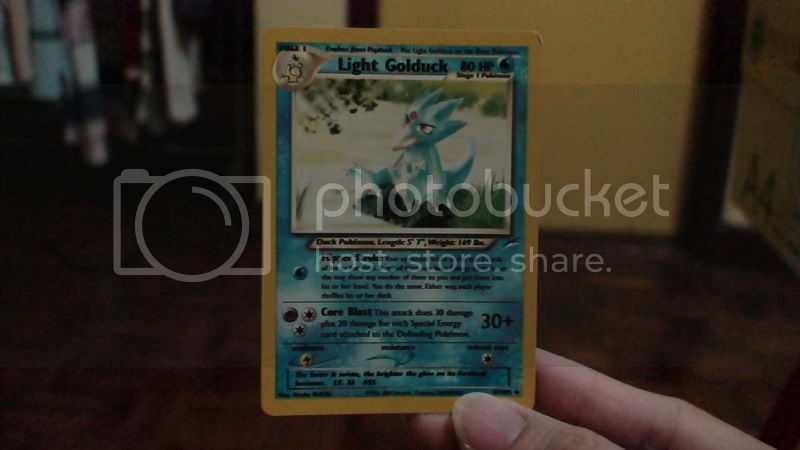 Need a price check on TSD and DR RH TV Reporter, Error Light Golduck and DP15 Shinx? Discussion in 'Collecting and Card Price Discussion' started by flyboy_87, Jun 22, 2008.
uh ya, TVR going for $5? i dont think so. Id say more like $50-$100 since it was redone in DF. Im a bad pricer though. Thank you. I have editied my first post with two more cards I need to have a price check on. I thought the EX: Dragon TVR is worth like $100 to $200 but I'm not entirely sure since hardly any have sold on ebay to look at what they went for.... but guys, you're acting like because the card is rotating it will be worth less money.... but this is a collectible card. Only a fool would play it, as playing with true reverse holos scuffs them up even when in sleeves. I see no reason as to why the card being rotated will reduce its value since it is such a rarity playing it is basically "unplayable". And coming out with a new one in DF has nothing to do with changing the rarity of the Dragon one. No matter what, that Dragon one will always be a rare card that people who want to complete their reverse holo set will need. Ironic how a Light Golduck is dark :lol:. Hmm, yeah, try to post a pic because I have plenty of old cards where some issues are normal light and darker print, so I don't think this will be worth much unless the darkening is really extreme. Is the back of the card darkened too? Never heard of Shinx DP15 being printed upside down, the only mass printed error like that (that I know of) would be holo Mew POP 5. Only one of these on eBay and it says nothing about it being an error, and only one completed auction and it says nothing about it being an error (but they're from the same seller)... so you could be in luck! TSD is $25-$35. Not more, no less than those prices. Rerverse Holo DR TV Reporter: The price is always varing on this card. I personally own one and I've been getting prices all over for it, from different players in different locations. It is probably the most expensive card I own. The lowest price I have been offered is about $60, and the highest was $125. My estimate is that its worth, at the minimum, 70 dollars. The maximum, I would say $125 dollars. I don't know anyone who would be willing ot offer more than that for it. two for $25, what a deal! Just so you know, that is nearly every single one that sold, only a few that went in the $25 to $30-ish range. Most in that range didn't even sell. Mew*: The back isn't darkened - it looks normal. The front is EXTREMELY darkened, making it look like a fake card. Thank you for your inputs, everyone. I appreciate it. Well, if there is one Shinx with the error placement, there must be at least an entire sheet of them.... probably a sheet of the darkened Neo Destiny cards out there too. Unlikely that you have the only ones, but there would still be a very limited number if the mistake was not run in too many prints making them quite valuable! So do any of you guys with those Shinx cards, are the messed up too? Unfortunately I do not have any. The price for TSD has dropped. About a month ago, i was looking for them. I got one for $20, and missed several that went for the same or less, because they only shipped to the US (how stupid btw). I think I need to take that card out of the deck. I did get a TSD for 17 bucks last year from a noob ebayer. This word doesn't mean what you think it means. At any rate, it's hard to tell by the lighting. Whoops, I made a typo, lol. Anyway the scan is up in the Error Card Museum; though it looks pretty small. You guys are wrong about tv reporter, its value is 45-60 USD, i collect, thanks!